I have never been to celebration like this before. I’ve been to social gatherings with lots of laughter and commotion. I’ve enjoyed elegant multi-course, white-table clothed, dinners with sumptuous delicacies, as well as fun backyard barbecues with kids running all over the place having a great time. But there was something different about this night. The joy was almost palpable. 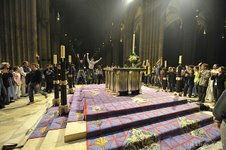 As soon as the three-hour vigil finished, just before midnight, the youth rushed to the front of the church to sing and dance. As the huge cathedral bells announced the arrival of Easter Sunday morning, near pandemonium broke out near the altar. Outside the circle of dancers, everyone was clapping, belting out the choruses led by Simoni, a guitar strumming, Spanish priest. “He is resurrected! He is resurrected!” “With him we died. With him we are resurrected. With him we live!” The mood was infectious. 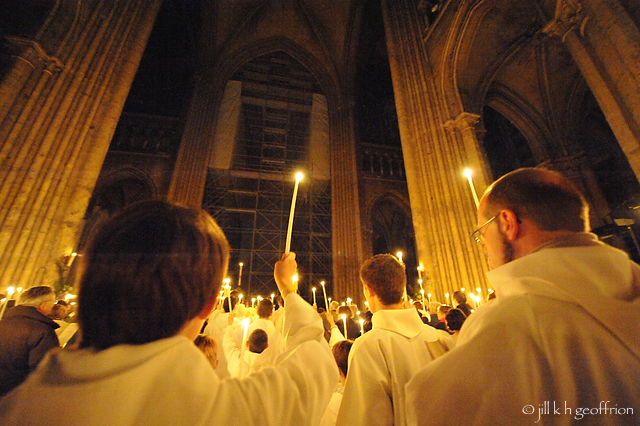 By one a.m. the Chartres cathedral finally closed its doors and the joyous singers took to the streets. I couldn’t fall asleep until at least two. Actually, I didn’t want to go to sleep. I never wanted to lose the feeling. In fact, I’m still smiling several days later, picturing the scene and recalling the laughter, the delight, and the great feeling of hope we all felt that night. In a flash I knew that all the money in the world could not buy what I was experiencing at the moment. The emotions ran high and love was overflowing. At the same, the feeling behind the celebration was very deep and the meaning substantial. The one who died on the cross for our sins came back to life again! Unheard of. Unparalleled. Life-transforming for his band of scared disciples and followers. Radically re-orienting. Hope-inspiring. Joy-producing. Confidence-building. Energizing. Motivating. Absolutely explosive. In the midst of the darkest of human realities, light has come into the world. No matter what difficulty we must face when we walk outside the doors of the church—and no matter what darkness we sometimes see when we look inside our own hearts and minds—there is more to the story. God lifts up those who look to him for life. Fighting for what’s right is not a lost cause. Seeking to live by love is not a fool’s game. Struggling to be a person of integrity is not a waste of effort. Though we may be exploited by the opportunists, be disadvantaged by the unscrupulous, suffer unjustly at the hands of others, or simply stumble over our own weaknesses and failures, God does not abandon those who put their trust in him. Jesus’ resurrection proves who is really in charge, and where true hope can be found. There is justice. There is forgiveness. There is reward for doing good. There is eternal life. What a great night! What a great Savior. Thank you for sharing your experience. God used your blog at this very moment to touch my heart. Thank you, Jesus! Tim, TY; your reflections are both adroit and profound. I met a Guyanese-American woman today at TreeHouse. She is the only believer in her [Hindu] family. She has experienced great pain and rejection but nothing has left her more hurt than the betrayal and ignorance of the man she married who called himself a “Christian,” but knows nothing of her faith and even less of the joy you have described. May God be patient with all of us when we choose to think ourselves satisfied with a nibble when the feast lies available before us.